If you’ve read some of the recent articles about corporate wellness programs, you may already be familiar with the positive impact that prevention can have on employee benefit costs. Whether you choose to work with a wellness program vendor or start a simple company wellness program on your own, the good news is that this effort doesn’t have to cost a whole lot, but the investment gives back so much. It’s been estimated that for every dollar spent on wellness initiatives, up to $3 is saved in health care premiums and $2 in absenteeism. This is about a 300 percent ROI, and it’s hard to find anything that compares. Wellness programs have also been shown to raise employee engagement levels, making them more productive and increasing revenues for any company. It’s very possible to put together a wellness program that benefits your employees while sticking to a small budget. To help you out, we’ve put together a list of 30 low cost employee wellness program ideas for any workplace. 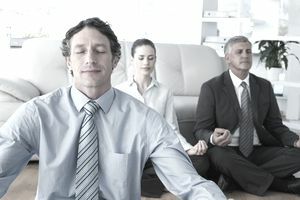 Onsite Wellness Services – Chair massages, meditation sessions, yoga instruction, acupuncture and more can be valuable wellness services that can be offered at low cost to employees. Set aside a special area where employees can sign up for weekly sessions at reduced costs. Free Healthy Snacks – Employee break areas and meeting rooms should be stocked with plenty of healthy low-fat snacks instead of salty or sugary ones. Give employees the ability to make healthier choices about the way they snack when you buy these products in bulk. Walk / Bike Paths – It costs next to nothing to establish an area around the company building for a walking or biking path. Simply designate an area of the company property for lunchtime walks, give out cheap pedometers to employees so they can track their movement, and a selection of bikes for employees to enjoy on their breaks. De-stress Zones – Every office needs at least one “safe” area where employees can cry, vent, or distress after a particularly tough day. Create space in your building where employees can get this out of their system without the embarrassment of losing it in front of peers. Employee Assistance Programs – These very low-cost programs give employees the ability to call a caring counselor about any area of their work or personal life to get confidential support when they need it the most. Water Coolers – Water is essential for a healthy mind and body, therefore your office should provide fresh water at all times. Get a water cooler through a local rental program or buy spring water in bulk cases and make sure the office fridge is stocked. Flexible Work Schedules – A zero cost benefit that gives employees more work life balance is a huge perk for many working people, especially those who are caring for others or raising kids. Give employees a flexible schedule so they can arrive at their chosen time in the morning, have lunches or work from home if they need to. Corporate Health Discounts – There are many ways to pass corporate health discounts down to employees for local gyms, YMCAs, and health product vendors. Fitness Room – Establish a workout area in one large office in your workplace by investing in second hand gym equipment, floor mats, and a smoothie bar. Catered Lunches – Employees may skip meals or make unhealthy meal choices when they are too busy or stressed out. At least once a month, make it a point to bring in a catering company to prepare and serve a healthy meal to your workers. Plants in the Office – Too many offices and workplaces are filled with stuffy, recycled air that can make employees feel sluggish. Make it a healthier place by adding plenty of oxygen-producing plants everywhere. Ergonomic Work Stations – A low cost way to maintain employee wellness is creating work stations that include back-supporting chairs, lots of natural lighting, and de-cluttered desks. Work with an office furniture vendor to secure these items for less. Exercise Clubs – Make the workplace fun and encourage employees to get up and moving with exercise clubs for walkers, runners, and those who love organized sports. A basketball hoop set up on one end of the parking lot can support this goal too. Employee Incentives – When employees make the ultimate choice to get healthy, lose weight, or break a bad habit, they often respond well to incentives like peer recognition, movie tickets, and reduced health insurance costs – things you can support. Cooking Classes – Talk to local restaurants and universities to see if there is a professional chef willing to come in to conduct a cooking class for your employees. This often low cost (or free) event can inspire employees to cook healthy at home for their families. Health Libraries – Create a corporate library that includes plenty of books on health and wellness topics, or add a digital health library to your company website for health information on-demand. Wellness Workshops – Along with health cooking classes, you can invite various health and wellness vendors and practitioners in your area to conduct wellness workshops in a “brown bag” lunch format. Health and Wellness Fair – Take this to the next level by planning an annual health and wellness fair that groups dozens of wellness and health practitioners, vendors, and services into one big area onsite. A few months before employee benefits open enrollment can be an opportune time to schedule a health and wellness fair. Management Retreats – Your management team has a lot of pressure on them all the time, so it’s important to give them the support they need to lead by example. Schedule a once-a-year management retreat at a health spa or local conference center, bringing in speakers and wellness practitioners at a reduced group rate. Stair Challenges – If your building has stairs, challenge your employees to use them instead of elevators with stair step challenges. Provide a bell on stairwells and encourage employees to ring them when they reach the top, earning an applause from peers on that floor. Breakroom Games – Gaming can help employees reduce the tension from their workdays. Install some rented basketball and arcade games in your break areas and encourage employees to visit them at least once per day for 15 minutes. Group Outings – Company picnics, team building, and other group outings can be very beneficial to employee well-being. Give managers the ability to schedule these outings at least once or twice a year for their teams. Food Co-op – Work with farmers and produce groups to bring in healthy fruits and veggies as part of a company-wide food co-op program at least once a month. Give employees the chance to buy these foods at a greatly reduced group rate. Paid Voluntary Insurance – Voluntary benefits can be very inexpensive and provide just the wellness support that employees need. They can also reduce financial stress by giving employees a buffer against the worry about health and retirement concerns. Corporate Rewards – While you are developing a wellness program for employees, remember that a rewards-based system often produces more favorable results. Regular recognition, rewards, and incentives help employees stick to their wellness goals. Paid Time Off – Offering employees the ability to take much needed time off with pay doesn’t have to cost a lot. Give them at least one PTO day that they can use for whatever they want to do for themselves. Volunteer Days – Once a quarter, gather your employees and get them involved in a community-wide clean-up day or some other type of volunteer service. This can be a highway beautification project, a local urban garden project, or a corporate car wash to raise money for a cause. Pets at Work – Stress is a number one killer in the workplace, and pets have been shown to reduce stress dramatically. Let employees have desk fish aquariums which provide the soothing sound of water, and have a once a year “bring your pet to work” day to experience this wellness. These are just a handful of the many ways to provide employee wellness support on a budget. We encourage you to include a few of them in your plan to create a unique corporate wellness benefit program for a better, healthier work culture for your employees. For more on employee wellness benefits see also 25 Low Cost Employee Benefits for a Healthier Year.